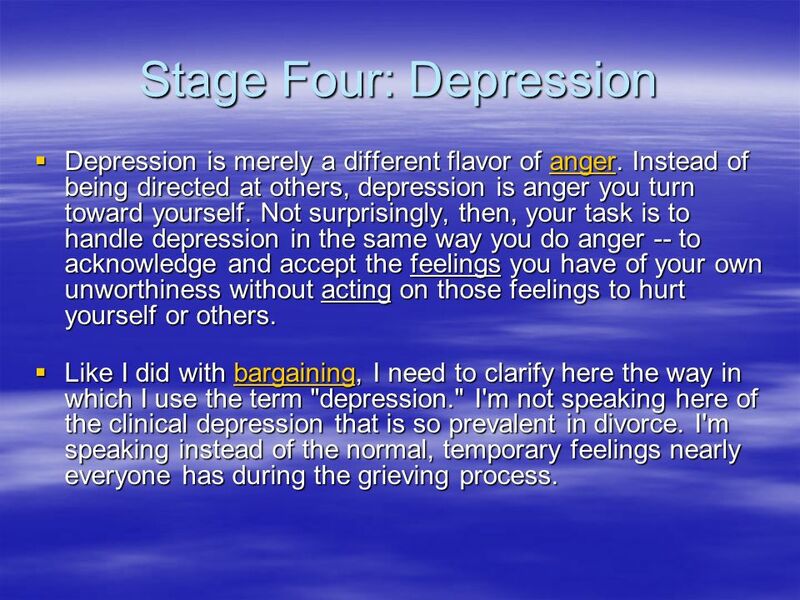 2 Five stages of grief From time to time, everyone experiences grief for one reason or another. 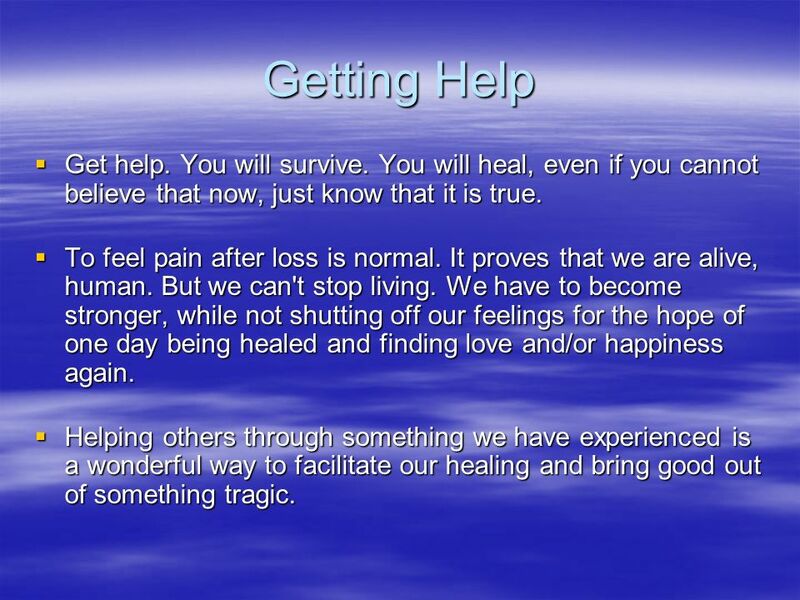 It is important to realize that there is a grieving process and that the process takes time, but you will heal. Stage One: Denial This can't be happening to me". No crying. Not accepting or even acknowledging the loss. Stage Two: Anger Why me? Feelings of wanting to fight back, get even, or blame others. 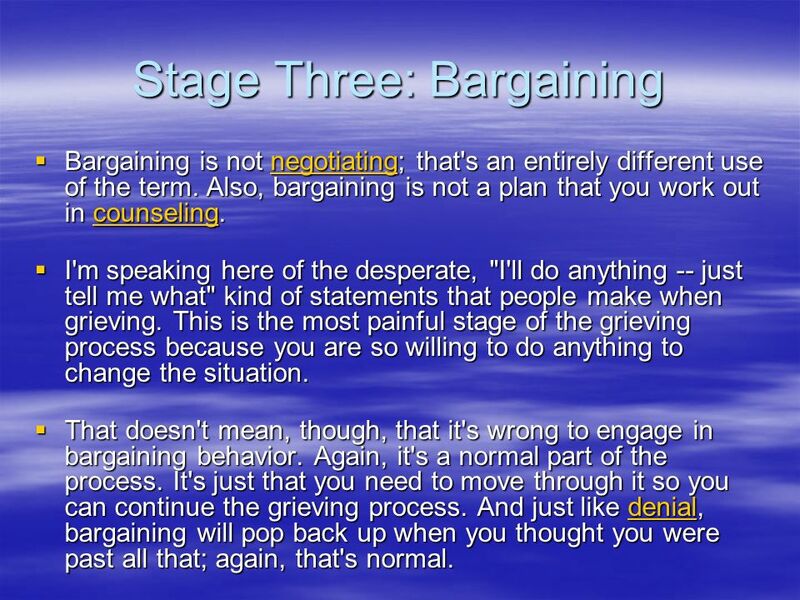 Stage Three: Bargaining Attempting to make deals with yourself or others to undo the harm. Stage Four: Depression Feelings of hopelessness, frustration, bitterness, self pity, lack of control, and feeling numb. 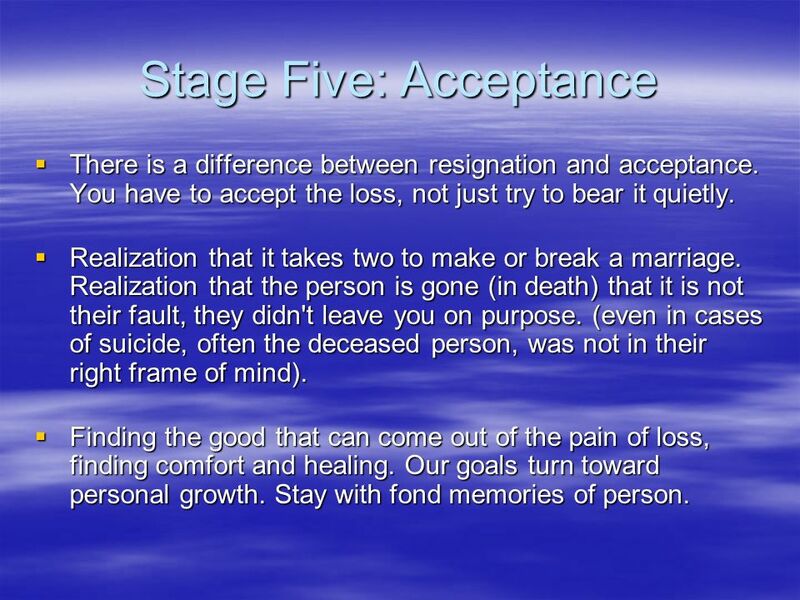 Stage Five: Acceptance Finding the good that can come out of the pain of loss, finding comfort and healing. Throughout this process, get help from friends, family, and the school counselor. 3 Stage One: Denial Surely this isn't happening to me. Everything's really okay. Surely this isn't happening to me. Everything's really okay. Denial is powerful, effective, and sometimes essential for dealing with crisis. There is a time and a place in which denial is perhaps the most healthy response. Eventually, however, there is a time and place for denial to end so you can confront the problem and begin the healing process. Denial is powerful, effective, and sometimes essential for dealing with crisis. There is a time and a place in which denial is perhaps the most healthy response. Eventually, however, there is a time and place for denial to end so you can confront the problem and begin the healing process. Then in the middle of healing, you may resume your denial. That's okay. That's normal. That's sort of what's supposed to happen when you're grieving. 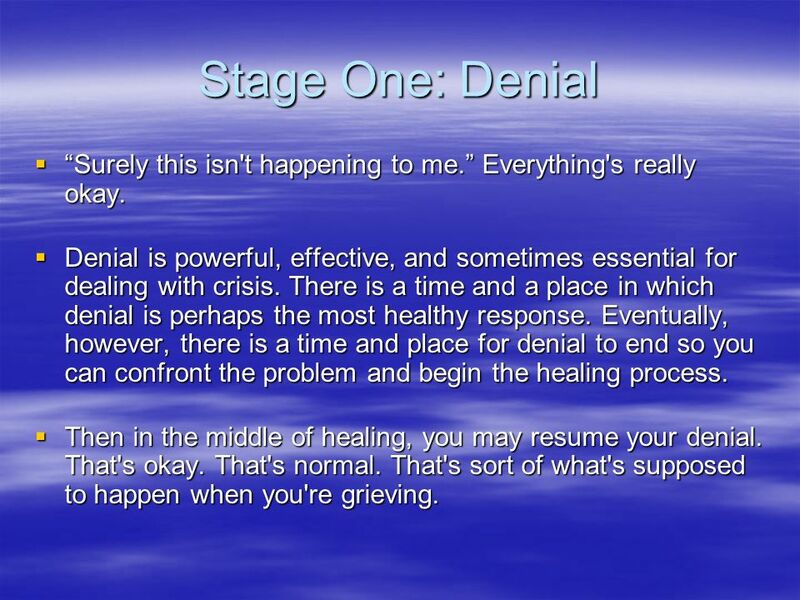 Then in the middle of healing, you may resume your denial. That's okay. That's normal. That's sort of what's supposed to happen when you're grieving. 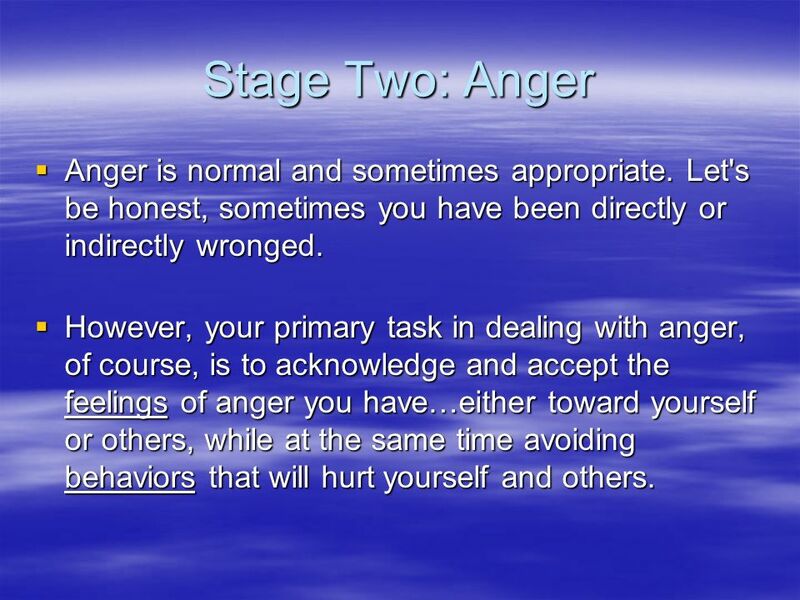 4 Stage Two: Anger Anger is normal and sometimes appropriate. Let's be honest, sometimes you have been directly or indirectly wronged. Anger is normal and sometimes appropriate. Let's be honest, sometimes you have been directly or indirectly wronged. However, your primary task in dealing with anger, of course, is to acknowledge and accept the feelings of anger you have…either toward yourself or others, while at the same time avoiding behaviors that will hurt yourself and others. However, your primary task in dealing with anger, of course, is to acknowledge and accept the feelings of anger you have…either toward yourself or others, while at the same time avoiding behaviors that will hurt yourself and others. 7 Stage Five: Acceptance There is a difference between resignation and acceptance. You have to accept the loss, not just try to bear it quietly. There is a difference between resignation and acceptance. You have to accept the loss, not just try to bear it quietly. Realization that it takes two to make or break a marriage. Realization that the person is gone (in death) that it is not their fault, they didn't leave you on purpose. (even in cases of suicide, often the deceased person, was not in their right frame of mind). Realization that it takes two to make or break a marriage. Realization that the person is gone (in death) that it is not their fault, they didn't leave you on purpose. (even in cases of suicide, often the deceased person, was not in their right frame of mind). Finding the good that can come out of the pain of loss, finding comfort and healing. Our goals turn toward personal growth. Stay with fond memories of person. Finding the good that can come out of the pain of loss, finding comfort and healing. Our goals turn toward personal growth. Stay with fond memories of person. 8 Getting Help Get help. You will survive. You will heal, even if you cannot believe that now, just know that it is true. Get help. You will survive. You will heal, even if you cannot believe that now, just know that it is true. To feel pain after loss is normal. It proves that we are alive, human. But we can't stop living. We have to become stronger, while not shutting off our feelings for the hope of one day being healed and finding love and/or happiness again. To feel pain after loss is normal. It proves that we are alive, human. But we can't stop living. We have to become stronger, while not shutting off our feelings for the hope of one day being healed and finding love and/or happiness again. Helping others through something we have experienced is a wonderful way to facilitate our healing and bring good out of something tragic. Helping others through something we have experienced is a wonderful way to facilitate our healing and bring good out of something tragic. 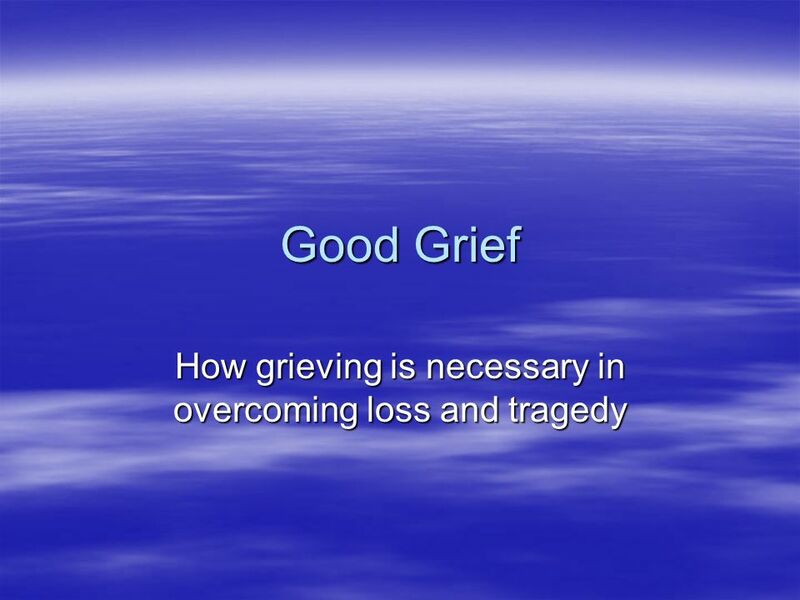 Download ppt "Good Grief How grieving is necessary in overcoming loss and tragedy." Understanding the grieving process helps you cope with loss and manage your feelings in healthy ways. Dealing with grief For death is no more than a turning of us over from time to eternity. William Penn. 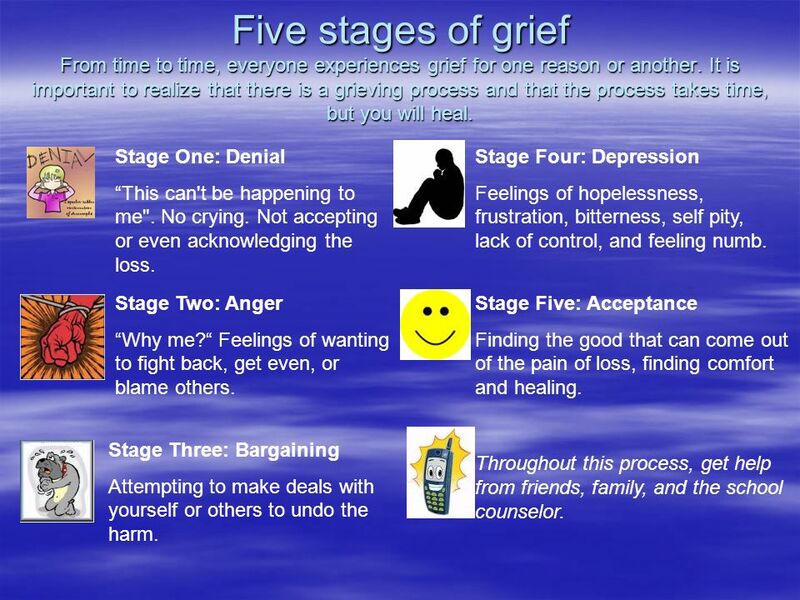 Some useful tips to help you deal with grief, and. Phase III: Becoming a Peer Advocate Photo by Don LaVange on Flickr. SPONGE 5.What do you look forward to in adulthood? 6.As you age throughout adulthood, how can you keep your mind and body healthy? List one way each. Growth. Grief and Loss presented for: Personal Touch Volunteers. Meredith Naidorf, MD Psychiatrist in Private Practice New York, NY.  What is grief?  Intense emotional suffering caused by a loss, disaster or misfortune. Click the mouse button or press the space bar to display information. 1.Identify causes of loss and grief. What You’ll Learn 2.Identify symptoms of loss. MENTAL HEALTH: Understanding Your Emotions Ms. Mai Lawndale High School.